Several products are expected to be showcased at the event, including the new 9.7-inch iPad, the 4-inch iPhone SE, and new Apple Watch bands. There's also a possibility that some Mac refreshes could be announced as the time is right for updates, but there have been no rumors confirming that is the case. Headlining the event will be the 4-inch iPhone SE and a new 9.7-inch iPad. Rumors suggest the iPhone SE will look nearly identical to the iPhone 5s, but it will include new internal hardware that brings it in line with newer Apple devices. It is rumored to have an A9 chip, an improved camera, and NFC support for use with Apple Pay. The new 9.7-inch iPad has been referred to as the iPad Air 3, but recent rumors have suggested it may instead be branded as an iPad Pro. The device is said to include many iPad Pro features, like a four-speaker design, a Smart Connector for connecting accessories, and display improvements for Apple Pencil support. It may also be the first iPad to feature a rear LED flash. Apple also plans to introduce new Apple Watch bands at the event. Existing bands will likely be available in new colors and there may be new product lines, such as a rumored nylon band and a Space Black Milanese Loop. 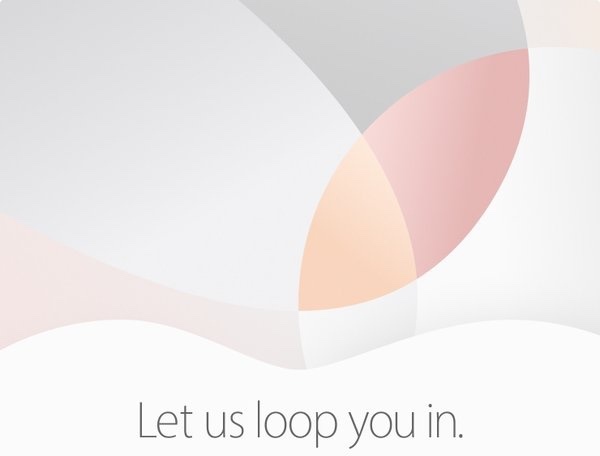 Apple will be live streaming the event on its website and through the Apple TV. MacRumors will also provide live coverage of the event, both here on our website and through the MacRumorsLive Twitter account. The four iPhone colors are in the image. That should squash any rumors about bright pink or other colors on the SE. I also take the "loop you in" tagline to mean we'll have a new Milanese Loop watch band. Cue over-analysis of the invite! "iPhone with built in wristband loop CONFIRMED!" :apple:Belt is clearly being released. New GarageBand loops. Calling it. Will it be streamed? On keynote days, our whole office orders food in and watches together. The 4in iPhone better have the same body design as the newer iPhones. It better not. Worst iPhone design of them all.